I went to the Big E on Monday with my wife and sister. Sunny with temperatures in the mid-60s, the weather was perfect for spending the day trekking around the fair grounds. Our normal Big E routine is to visit the Better Living Center, the six New England state buildings, and anything of interest in-between. Food wise, I wanted to try the clam fritters aka clam cakes that I saw in the Rhode Island building last year, so when my wife and sister got foot-longs at the Frankie's booth at the Connecticut building, all I had was a few bites of the dogs that the ladies were willing to share with me while I banked my calories in anticipation of the clams. In the Vermont building, I had dessert (before my main course), a delicious slice of apple pie topped with vanilla ice cream. I shared it with the ladies, but I could have eaten the whole thing myself! Rhode Island was the last building in the New England states lineup and I bought a bag of clam fritters for $6.50. What a disappointment. Five days later and I am still looking for the clams! My wife joked that I bought a bag of fried dough balls instead of clam fritters. It was an expensive joke, but we laughed about it the rest of the day. 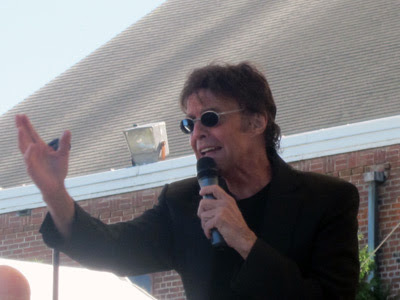 The highlight of the day was the free Mark Lindsay concert (photo above). We found seats in the second row just as the concert began and we had a blast for 45 minutes. Lindsay performed most of the big hits he sang as lead singer of Paul Revere and the Raiders and he also sang his solo hits. There was a lot of energy in the performance and in the audience. It reminded me of when we attended a Paul Revere and the Raiders concert in the 1960s at the old Oakdale theater-in-the-round in Wallingford, CT.
On the way out, I perused a souvenir stand and was surprised to see a set of new Big E postcards for sale. I collect postcards and have a stash of Big E's in my collection, but there has been nothing new Big E postcard-wise in decades. Scoring the new set for my collection was a nice way to end a great day.